Emerald Cut Sky Blue Topaz Sterling Silver Shield Pendant White Pearls Facetted Topaz Beads Sterling Silver Spacers and Clasp – 19″. 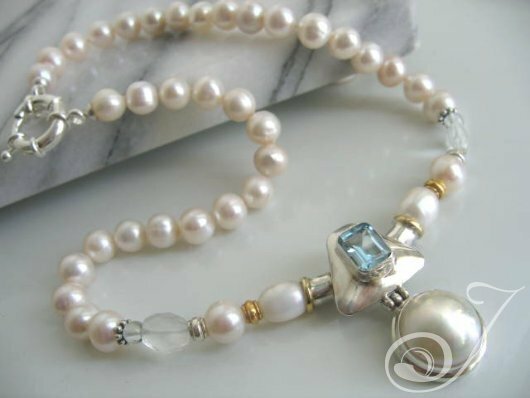 Truly a gorgeous white pearl bridal pendant necklace. No better way than this, to add “a touch of blue” to your wedding day success. Great on olive skin, for the bride who has everything, this statement piece that will add to the beauty of the pictures taken on the day. A timeless necklace that can be worn over and over again. One of Julleen’s most dynamic images. The above style is the one sitting under all the layers of luscious pearls. Gorgeous!